This bench is really a masterpiece. This is why it won the title of best adjustable piano bench. It doesn’t just look like a nice piece of furniture. It adjusts perfectly to any acoustic or digital piano. It’s heavy and sturdy enough for you to feel comfortable and secure while seated on it; which will result in a distinguished experience while playing the piano. You being comfortable while playing is something of a high importance. You should not think about the fact that you can’t find your stance, but you should focus all your attention on playing the instrument. The leather is of a great quality and together with the shiny finish of the legs make up a classy and elegant look. Some people may complain about assembling the bench. You shouldn’t be experiencing any difficulty. I had the legs up in few minutes and can assure that you can’t go wrong. Under the main seating area you gave a storage are. It’s perfect for your sheet music and other learning material. The piano bench has two knobs for height adjustment. You can use either of them to lift the entire seat. It’s not necessary to adjust both trying to balance them. This is a feature that I thought to be very practical. The leather seating area is very comfortable, although being firm. It will be easy to practice for multiple hours before getting tired. It’s also perfectly suited for beginners who practice piano with a teacher. 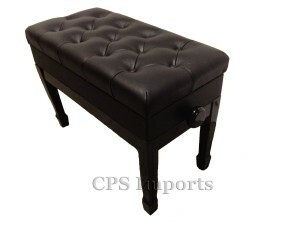 It’s especially designed to sustain two people with ease, offering a comfortable experience, deserving its recommendation as the best adjustable piano bench.